Carlos Castaneda learned the art of hunting from a man in the shadows, a teacher, a mirage. His mentor, Don Juan, refused to be defined, refused every attempt to be categorized. 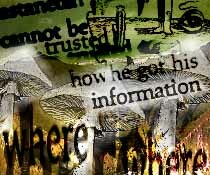 You can read about him but you can never really be sure just who he was. You can paint a picture in your mind of Don Juan but you can bet it will be blurring at the edges, moving faster than your mind can box him in. Fact or fiction? Did this character really exist or did Carlos pull him from some magic hat like some of his anthropological "peers" so confidently claim? "The pathological countertransferences are everywhere," M.D. Faber loudly proclaimed. Volumes have been written discrediting Castaneda, his fellow colleagues upset by the "methods" employed by both the student and the teacher. We aren't here to join this debate but to look closer at what is happening inside the warring factions. The fiery battle between truth and falsehood rages on and on. Its heated remnants like coals that refuse to be extinguished. In the center of this inferno lies a man willing to endure the flames for eternity. A man willing to set aside everything in the name of Life. Those who bear the burden of teaching the truth can never be pinned down by the thoughts of others. They need no explanations for their actions, they have no position they must so proudly defend. Truth comes in the talons of the falcon, those razor sharp edges ready for the kill. On the ground we look up and hear a rustle in the wind, unaware that anything has happened. A moment later we are lost in our own dilemmas and twisted histories, lost in the unending sea of confusion and distraction. A sea we welcome with open arms, blind to its empty rewards. We are unwittingly accessible. Once Don Juan told Carlos, "A hunter knows he will lure game into his traps over and over, so he doesn't worry. To worry is to become accessible. And once you worry you cling to anything out of desperation; and once you cling you are bound to get exhausted or to exhaust whoever or whatever you are clinging to." Don Juan told Carlos, "You take your self too seriously. You are so godamned important that you feel justified to be annoyed with everything!" It seems at times the debate will never end, and it really never does. One just eventually and gradually becomes able to lower the volume bit by bit until one day it disappears completely. Then suddenly the change comes. A change you initiate,a change no one can predict, a change only you can prepare for. In that shining moment the eye of the falcon becomes your eye. His speed. His momentum. The gracefulness and agility of the hunter are yours for an instant. "In a world where death is the hunter there is not time for regrets or doubts. There is only time for decisions." 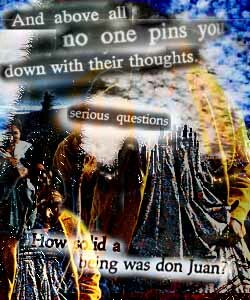 These words of Don Juan point us in the direction beyond blind belief, beyond the need for validity and scientific authenticity. They lead us to the unexpected conclusion that we are not immortal, that, yes, we too will someday die. Someday we will all fall prey to the tireless hunter named death.